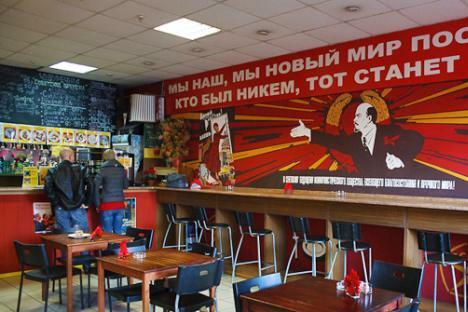 The Soviet style fast food joints still exist in Moscow and look like the Soviet relic. Regardless of their lack of glamour and old-fashion design, they are popular among some Russians. Probably the only remaining blini house in the capital, Blinnaya will be celebrating its 50th birthday next year. The blini here are cooked according to a traditional Soviet recipe. The most popular types are the ones with jam, butter and sour cream; however, meat blini are also served. In addition, the menu lists a couple of different types of salads, soups, and popular pelmeni. Liquor is available here, but not beer – although guests are allowed to bring their own. Taking advantage of the business opportunity, the popular liquor store chain Aromatny Mir opened a new venue next door. Most of Blinnaya’s patrons are those who occupy the margins of society, such as cab drivers and migrant workers, but there’s the chance to also meet students from the nearby college. Plus, there’s no need to worry about being pick-pocketed – the blini house is located directly across from a police station whose employees often come here for their meals. Club manners are not in vogue here. Instead, you will find respectable retirees – particularly from the security services. Almost every other customer at Aist Café has at one point in his or her lives worked for the KGB. The main offerings here are a variety of sandwiches with boiled pork, fish, sausage, and even caviar. But the real attraction of Aist Café is the grilled sausage with green peas. Well-done and juicy, the dish provides ample nourishment to keep you walking through the Old Town. A few feet outside is a popular club called Chinese Pilot Jao Da, where musicians occasionally drop in for a few minutes before concerts. They usually don’t stay for long – they’re too vain for this staid place. A cheburek is a semicircle-shaped dough turnover with meat and soup inside, which is always served hot; a cheburechnaya is a place that serves these tasty treats. At one time, this cheburechnaya hosted representatives from Russia’s nationalist parties who had gathered to discuss ways to rebuild the country. Ultimately a couple of disputes turned into scuffles, the nationalists were kicked out, and the establishment expanded. All that had no effect on the chebureki: they are of excellent quality and the broth inside of them is properly thick and flavorful. In addition to the chebureki, try the Georgian kharcho soup. Last but not least, the café’s trademark offering is a homemade horseradish liqueur. Perfect for admirers of vintage style, Soviet Times Cheburechnaya’s walls are plastered with Soviet-era posters, photographs of former party leaders and heroes of socialist labor. Liquor is not served, but the local dark beer is quite decent. There’s not much to be said about the chebureks – they get a strong C grade and don’t come with any special frills. For a hearty meal, it’s best to order the pilaf or pork chop. Not far away is a cinema in which art house premieres are regularly shown, so there’s always the chance to become inspired at the cheburechnaya and venture over for a thoughtful film. Located directly across from the Soviet Times Cheburechnaya on the Garden Ring, this khinkalnaya lit the fuse for today’s Moscow obsession with its namesake, big Georgian dumplings. Generally speaking, khinkali shops cater more to sit-in diners, but for a pit stop, this is just the place. Indeed, Moscow artists and members of the band NOM have developed a fondness for the place. This is how you eat khinkali: carefully pick one up by the doughy tip (use your hands, not a fork! ), bite into the side, sip the broth, pour some sauce inside and then eat it whole, taking care not to spill the meat juice. Four should be enough for a quick snack; seven will be more than enough. This is how a French blogger once described Second Wind Rumochanaya: “On my way to my office there’s a strange and scary place. The door is always open and there are always people standing up drinking vodka and shouting.” All this is true – and they’ve been drinking and shouting here for over a century. A rumochnaya has stood on this very ground since the tsarist era. It may have the cheapest vodka and snacks in Moscow; you can throw back a shot and have some pelmeni for 100 rubles ($4). Don’t bother worrying about food poisoning– the quality is decent, but it’s best to avoid interacting with the locals. On Thursdays, as strange as it sounds, there’s live music: a homeless duo perform on the accordion and guitar. Their repertoire is quite extensive, ranging from “Besame Mucho” to classic Soviet tunes. The exact opposite of the previous establishment, this is the most respectable of Moscow’s rumochanayas. The restaurant has been here for more than 20 years, and it is also the site of a former pre-revolutionary tavern. There are regular poetry readings and sometimes actors from the nearby Mayakovsky Theater drop by. The chakhokhbili, a Georgian-style chicken in tomato sauce, is noteworthy. Also served is decent unfiltered beer. Another advantage is the rumochanaya’s location; a mere 10-minute walk from the Kremlin. In the end, if after visiting the mandatory cultural attractions scattered about Moscow you have the urge to get into the spirit of Russian poetry and acting, you’ll want to come here.